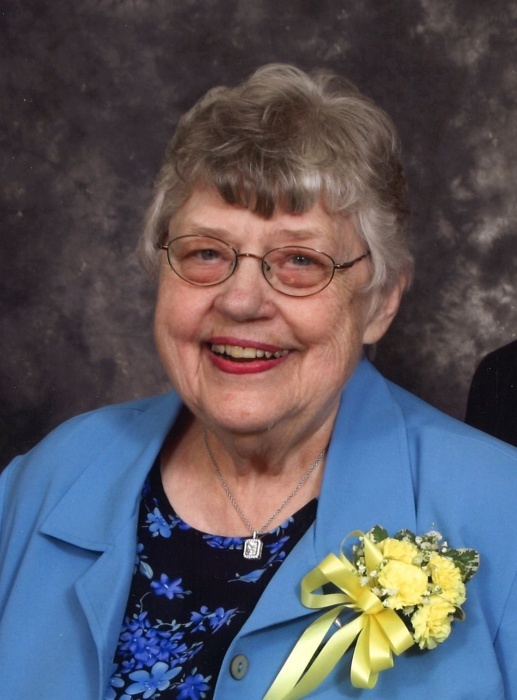 Pearl E. Suhr, age 84, of Correctionville, passed away on Friday, February 08, 2019 at the Mercy Medical Center of Sioux City. A funeral service will be held on Tuesday, February 12, 2019 at 10:30 AM at the Grace Lutheran Church of Correctionville with the Rev. Leland P. Schmidt officiating. Burial will be at the St. Paul Cemetery (Midway) of Battle Creek. A visitation will be held on Monday, February 11, 2019 from 4:00 PM – 7:00 PM with a prayer service at 7:00 PM at the Nicklas D. Jensen Funeral Home of Correctionville. Pearl Evelyn Suhr was born January 26, 1935 on her grandparents farm in Atkins, Iowa to Martin and Elda (Rinderknecht) Bayer. She graduated from Guernsey High School, then attended Concordia Teachers College and Morningside College where she earned a teaching degree. She was united in marriage to Arlo Suhr on May 29, 1960. To this union three children were born, Mark, Annette and Donna. Pearl taught school at the Lutheran School in Victor, Iowa, Lotts Creek, Hanover in rural Alta, Iowa, Eastwood and River Valley. She was nominated for Who’s Who Among Teachers. Pearl was a member of Grace Lutheran Church of Correctionville where she was active in the LWML. She enjoyed reading, sewing, quilting, cooking and baking, gardening, going to craft shows with rugs she had made, and the Iowa Hawkeyes. She loved attending her children and grandchildren’s sports activities and musical programs. She is survived by her husband, Arlo Suhr of Correctionville, IA; children, Mark Suhr of Jefferson, SD, Annette (Bryan) Heeren of LeMars, IA and Donna (Clark) Davis of Schaller, IA; grandchildren, Michael Nelson of Correctionville, IA, Amber (Jamie) Smith of Peosta, IA, Laura Nelson of Correctionville, IA, Audrey (Grant) Davis of Garland, TX, Andrea (Cody) Porter of Holstein, IA, Andrew Davis of North Liberty, IA, Amanda Davis of Schaller, IA and Anna (Kaleb) Davis of Red Oak, IA; great-grandchildren, Kayleigh, Addison and Cooper Smith of Peosta, IA and Jax Porter of Holstein, IA. She is also survived by brothers and sisters, Martin (Betty) Bayer of Guernsey, IA, Doris (Marvin) Stanek of Walford, IA, Violet Hall of Blairstown, IA, Marine Keyes of Ladora, IA, Delmar (Rose) Bayer of Victor, IA and Lucille (Jim) Tuttle of Altoona, IA; and brother-in-law, Lester (Jeanette) Suhr of Alta, IA; and many nieces and nephews. Pearl was preceded in death by her parents; two sisters, Linda and Phyllis; three brothers-in-law, John, Roger and Verdeen; one sister-in-law, Betty; two nieces, Jamie and Joelle; and many aunts and uncles.